Used for bonding ceramic tiles to floors and most walls. Contains a high level of added latex powder so there is no need to use expensive admixtures. WHITE SET FLEXIPLUS can be used internally and externally and bonds to most building substrates such as concrete, cement screeds, render, timber etc. Ideal choice for fixing white tiles to floors and walls as the adhesive will give no show through. The added powder polymer makes it the ideal choice for bonding low porosity tiles such as marble, marble composite, certain natural stones etc. 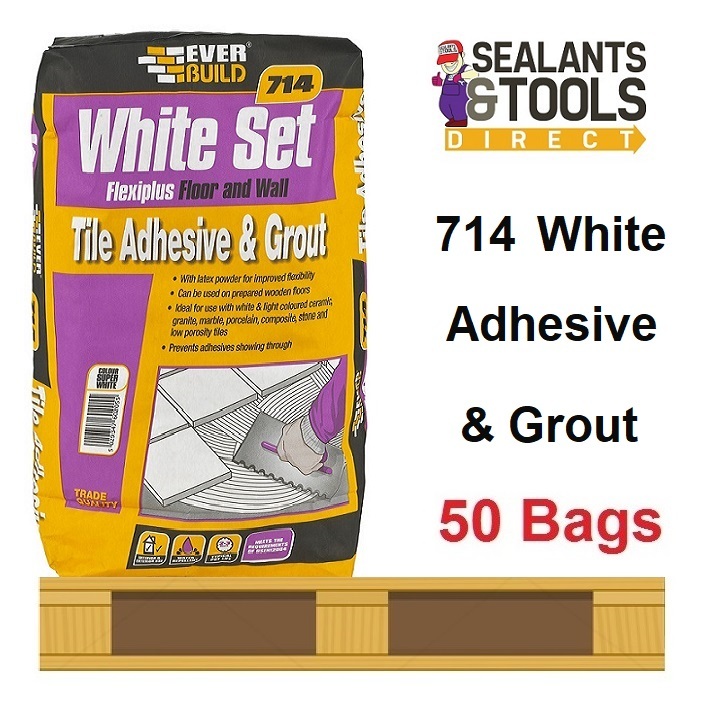 WHITE SET FLEXIPLUS may also be used as a white grout for floor tiles. Note; Product dries off white. Flexible formula for use where natural movement may occur. Bonds to most common building substrates. May also be used as a grout for floor tiles. Recommended for tiling domestic, communal and power showers. May also be used for patching small areas in concrete stone etc. As a grout for floor tiling applications. Always mix with clean fresh water and always prime bond surfaces as directed. Prime surfaces with EVERBUILD PVA BOND diluted 4 parts water to 1 part PVA Bond and allow to dry. Never exceed the quantity of water stated. This will dramatically reduce strength and cause failure. Do not mix more powder than can be laid in 1-2 hours and never try to reconstitute once the product has set. Floors must be prepared as directed and free and all obvious movement before tiling. Existing concrete sub floors must be a minimum of 4 weeks old before overlaying with this product. Do not use for wall tiling onto gypsum based plaster.